Butter is good for you? 5 Reasons Why Why Butter is a Superfood! Butter is good for you… really! You may be holding back a gag reflex after reading that. Perhaps you are still staring at your computer screen mute shock. In either case, you are probably wondering WHY I committed this senseless act of nutritional suicide. Yep, butter is the highest dietary source of this powerhouse fatty acid. Not surprisingly, CLA concentration varies on the animal’s environment. CLA concentration is 4 times higher in summer milk than winter milk, due to pasture grazing. In a number of studies, conjugated linoleic acid, at near-physiological concentrations, inhibited mammary tumorigenesis independently of the amount and type of fat in the diet. Additionally, this fatty acid has been shown to inhibit the growth of breast cancer (1, 2). One study done with rats shows why butter is so important for children to eat! CLA fed to rats before the peripubertal period prevented the growth of tumors, but when the rats weren’t fed CLA until maturity, they had to consume the fatty acid for the rest of their life to prevent tumor growth.. Butter contains 4% butyric acid, an anti-carcinogenic short-chain fatty acid. Butyric acid actually inhibits the growth of mammary tumors. You can’t blame the butter when Paula Dean’s recipes make your jeans a little tighter (that would be the Crisco, white flour and sugar). Butter is a rich source of short and medium chain fatty acids, and these molecules “are not deposited to any extent in the adipose tissue” (source). 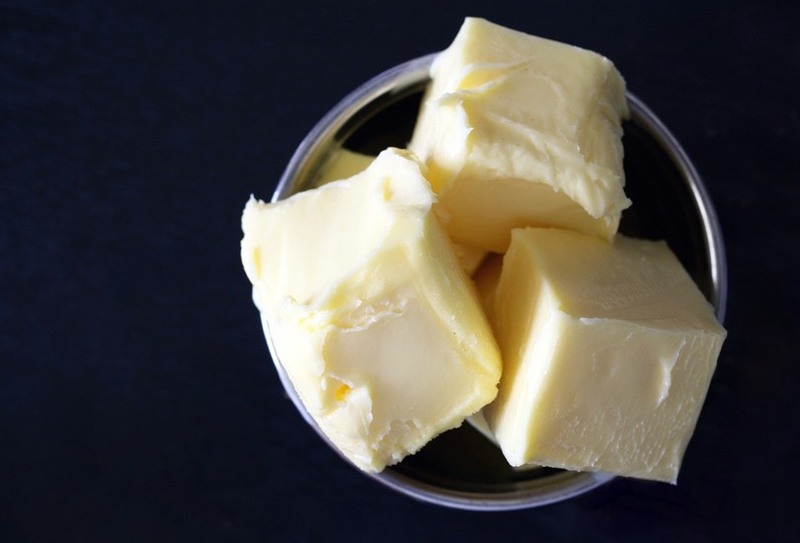 As a matter of fact, the fat in butter plays a key role in weight management and satiation. First, the fatty acids in butter stimulate the release of bile, which allows absorption of vitamins and eliminates toxins and old hormones from the body. Second, the fats in butter slow down the absorption of sugar into the blood stream. Carbohydrate consumption should always be paired with a source of healthy fats, like butter, to improve blood sugar stability. When our blood sugar is stable, rather than jumping from super high to low, we feel full and do not experience sugar cravings. Weston A Price, an early 20th century dentist who studied the effect of diet on tooth decay, discovered the astounding therapeutic use of butter for treating illness. He credited its health-giving properties primarily to an activating substance. “For want of an accepted identification,” he wrote, “I have referred [to it] as Activator X”. Now, we have discovered Activator X is vitamin K2 (source). In his book, Nutrition and Physical Degeneration, Weston Price recorded his investigation of this vitamin. He found that butter high in the activator, combined with “a favorable selection of natural foods” successfully treated tooth decay. Interestingly, the concentration of the Activator X in butter varied greatly depending on the cow’s food with a prominent increase when the cows were pasture grazing. While feedlot cows have virtually no K2 in their butter, dairy from pasture-grazing cows is rich in K2 and other fat soluble vitamins. Search for pasture butter in your grocery store or purchase it from a farmer who allows his cows to graze in the grass. Scientists continue to explore the importance of K2 in diet. A recent study published by an European nutrition journal showed that an increased consumption of K2 may reduce the risk of prostrate cancer by 35 percent (Kresser, 2008). Butter contains vitamin K2, an important fat-soluble vitamin. Butter also provides a potent source of vitamins A, D, and E, is the perfect carrier for these vitamins because it provides the fat necessary for their absorption. As a matter of fact, it offers these vitamins to your body in the most assimilable form. Take vitamin A, for example. In animal sources such as butterfat, vitamin A is a retinol is ready to be used by the body. On the other hand, the body is very inefficient at converting cartenoids from plant sources (like beta-carotene in orange veggies) into useable vitamin A. In infants, individuals with thyroid disorders and those on a low fat diet, this cartenoid-to-retinol conversions is virtually insignificant (read more). As a result, we should only consider true vitamin A foods as sources of this key nutrient. What about butter and cholesterol? In the 1950’s, Ansel Keys formulated the diet-heart hypothesis which states that a diet high in saturated fat increased the risk of heart disease. His hypothesis and research skills, however, were utterly mislead. The Diet-Heart hypothesis, as it is called, has been proven false over and over. Studies show that a low fat diet increases triglycerides and lowers HDL cholesterol. A meta-analysis in the American Journal of Clinical Nutrition shows that there is no evidence that saturated fat causes heart disease. As a matter of fact, the cholesterol and saturated fat in butter is uniquely important to health. Science tells us that cholesterol does not cause athersclerosis. As a healing agent in the body, levels of cholesterol rise during periods of stress or when inflammation is present. Providing cholesterol through good quality fats, such as pastured egg yolks and grassfed butter, allows the body to use cholesterol to help address the inflammation. One area of confusion is the labeling of LDL as “bad cholesterol” and HDL as “good cholesterol.” We know that high levels of HDL cholesterol is beneficial and we know there are subtypes of LDL cholesterol. The large, fluffy LDL particles are benign but the small, dense LDL is correlated to heart disease. Sources of saturated fats (like butter, animal fats, and coconut oil) change the dense LDL to fluffy LDL and raise HDL cholesterol… both health protective factors! Processed grains (like cereal) and vegetable oils, however, turn the fluffy LDL into the dense LDL, increasing the risk of heart disease (read more). For more information, I recommend reading Put Your Heart in Your Mouth and Nourishing Traditions, two great books that list numerous studies that further prove the diet-heart hypothesis wrong. Butter is truly a superfood! Life presents us with wonderful serendipities… like making butter good for you! So what are you waiting for? Go make a batch of healthy Buttermints and put a generous helping of butter on your vegetables. Do you agree that butter is a superfood? Then use the sharing icons below to spread the word! Very impressive blog,I use to feel that butter is just and unwanted fat, but after reading your article I got good idea about how beneficial butter can be. Thanks for sharing This info. Thank you for opened my eyes from wrong past information on butter. I am confused is Celery (that I love) good or not good for you? I have high cholesterol and i am eating raw butter is it good or bad? What if you have an autoimmune disorder.. or two? Tributyrin is the natural butyrate found in butter and it’s the superior form of butyrate for digestion, absorbability, and bioactivity. It’s been the subject of much research and is proven to be more potent than other forms of butyrate.